Thermocouple terminal blocks with miniature TC connectors. Audit your temperature signals anytime, anywhere without interrupting the signal. The new patented DRTB-2 Series thermocouple terminal blocks are manufactured with thermocouple-grade alloys to guarantee accurate readings. A built-in SMP-compatible female receptacle accepts a miniature thermocouple connector. The female connector allows the user to connect to a handheld meter for applications such as data collection, quality assurance compliance, capability studies and trouble shooting installation or repairs. The plastic housing is made from gray polyamide 6.6 thermoplastic resin with aUL 94 V0 rating for 85°C. 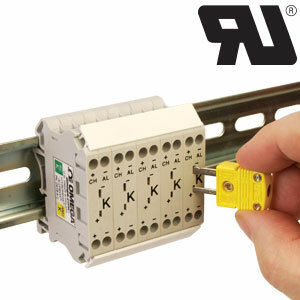 These thermocouple terminal blocks are fully enclosed and require no end plates. The screws are stainless steel and captive and the wire clamps are made of tin plated brass. Together they provide an excellent vibration, maintenance free and corrosion resistant connection. DRTB-2 terminal blocks mount on standard 35 mm DIN rails or 32 mm G-type rails, and are identified with calibration type and positive (+) and negative (-) connections. Wire entry is funneled to allow quick wire insertion even with stranded wire. Note: This item is available in single unit and multipack configurations.